Another pillar in Aquilina’s marketing plan has been a proactive social strategy. As he points out, social channels are “a forum for very passionate folks with strong opinions on Holden either venting their spleen or having a pronounced point of view”. “At first, you fear to participate in that space and attract negative sentiment. But we looked at how to utilise this attitude we are developing around the brand overall to tackle this completely differently,” he says. The first step was recognising there’s no middle ground on the Holden brand: People are either going to give the brand a one out of 10, or a 10 out of 10. “Sales staff through to people associated with our brand nationally were quite affected by the negative sentiment, and that negative was winning over. It was at the point where my team and dealers were fearful of posting what is otherwise positive, good news stories around the brand,” he says. “We had this double impact of negativity leading, then withholding anything positive for fear it attracts more negativity. This personality harkens back to Holden’s brand approach, which has been distinctly Australian, exudes confidence, and uses humour to be charming and charismatic, Aquilina says. “Our theory was our supporters will come in behind us if we can be the vanguard with well-placed humour that diffuses the negativity and turns it around by being plucky,” he says. “We started doing that and have seen an amazing reaction. What we discovered is that at the heart of the most negative comments is a positive. When you turn around and use humour to respond and diffuse the comment, those individuals come back saying ‘that’s why I love Holden’. It turned out our harshest critics were our biggest and most passionate fans. Simultaneously, Aquilina has been bringing in new disciplines and processes to assemble a strong A/NZ marketing leadership team internally. It’s a mix of old and new, with staff coming in from marketing across other parts of the GM business, from New Zealand, and existing local employees. Key was making sure the right talent was in the right spots. “Within 15 days, we’d restructured marketing across both countries, which was a pretty significant change, including for myself. There has been some fine-tuning since, but without knowing exactly how we were going to get to where we needed to be, we had to set up the way I thought gave us the best chances of success at that point in time,”Aquilina explains. Complementing this was an emphasis on modernising the marketing department, and setting up the right digital and CRM teams. Work still continues on Holden’s wider brand definition. But with cars to sell today and tomorrow, the team has needed to push ahead. “Being pragmatic about it, we are going to go with a character and personality that will carries this for a while until we sort out the true brand definition of Holden. That’s about the way we want to be perceived consistently and over time,” Aquilina says. The next priority for Aquilina is better presenting the Holden brand in the digital space. “You can’t just think about your own brand presence, we have the whole dealer network, partners, sales and consumer journey which includes third-parties you don’t have full control over,” he points out. The ambition is to get in front of shoppers at the right part of the journey and as they move from a Holden to dealers’ experience. 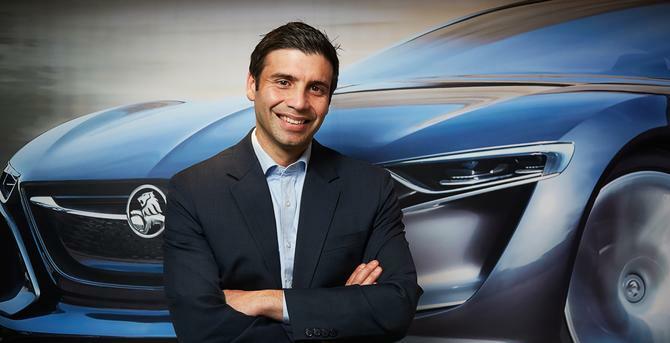 “It’s tempered by the amount we can invest in IT, user design, CX and the assets we have available through GM,” Aquilina admits. “It’s about how can we prioritise to give us the best chance of success. So firstly, we’re focused on tier-three sales and their digital presence. “There are 180-odd dealer websites people are visiting and there’s a lot going on with the shopping journey before making an inquiry or shopping action. We wanted to start at the point of most importance in terms of monetising our digital presence. We have invested in a new platform since I joined, and make sure customers can interact with us using their mobile devices, that we’re optimising our presence in third-party sites, Google rankings, and so on. With bigger questions around the Holden brand still to be addressed, Aquilina recognises it’s early days and it’ll be a long haul. “We have big objectives, but everyone is pretty well aware of where Holden’s challenges lie and it needs to be reflected in the way we prioritise and assign resources, and which issues we tackle and in what sequence. More widely, rebuilding the brand will take awareness and appeal, as well as credibility – something Aquilina hopes another sub-brand, Colorado, and its commercial vehicles, will help achieve.